Better Insights, Decisions, & Results. Are you spending too much time trying to gather your company's raw data from various sources including your Customer Relationship Management (CRM), accounting software, marketing software, and inventory management software? Using TEG IQ, you will be able to understand, track, and analyze your company's data. Additionally, you will be able to monitor metrics and key performance indicators (KPI) to help you make sound day-to-day management and strategic business decisions. In the past, many business professionals relied on Excel to manually create reports and visual graphs. TEG IQ provides the opportunity to analyze data quickly without spending hours to creating a report. 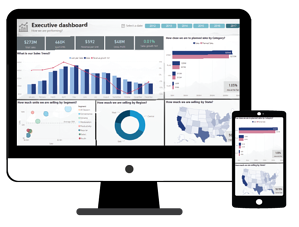 Dashboards allow business owners and key employees the ability to quickly and visually see their business at a glance. The dashboard displays a company's data in real-time, meaning the graphs are updated each second with the newest data allowing fewer man-hours spent on recalculations. Our interactive dashboards make it easy to quickly filter the graphs to analyze specific data such as sources, dates, and professionals. For example, if you are a healthcare facility and you want to quickly see which physician has seen the most patients in a particular time frame, you would filter by physician. For more information or to watch a demo, please contact us! Bob Koechig is a proven business leader, with over 10 years of data analytics and business consulting experience. With a Bachelor of Science degree in Information Systems Management, he uses his skill set in technology and security to assist companies with better reporting, using real-time business intelligence, data visualization, and dashboard reporting tools. Through these tools, business owners are able to view and understand their business’ performance quickly. In addition, he helps companies identify, improve, and streamline complex work processes. For more information on our Data Analytics Services, contact Bob at rkoechig@tegiq.com or click the contact us button below.